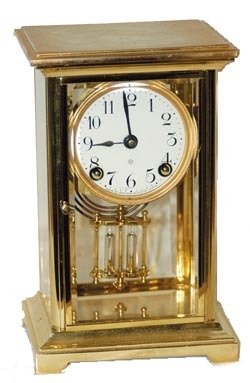 Ansonia Clock Co., crystal regulator, "Dorval", ca 1914. This is a beautiful, miniature brass case, shining like a new dollar. Signed one piece porcelain dial, 4 perfect beveled glasses. The little guy is 8.8" high and near perfect. Pawpaw went to sleep with the buffing machine running and polished the top a little close to the base metal. Not bad unless you examine close. Movement is 8 day, striking a hanging gong on half hours and hours, and running strong. Simulated mercury pendulum also mint. Ly-Ansonia No. 375.